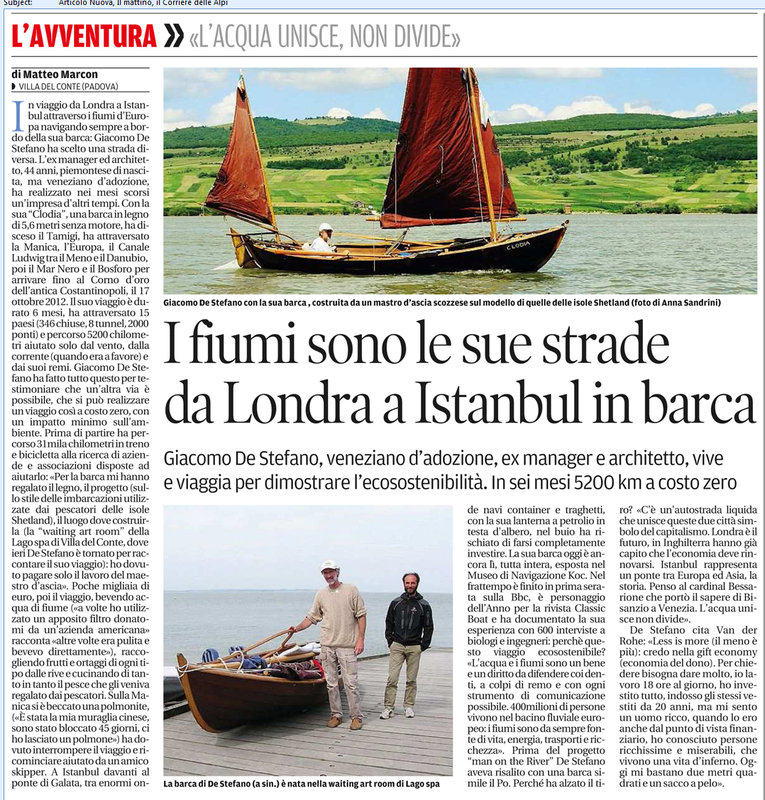 During his voyage, which begins in London in May 2011 and is due to arrive in Istanbul in October, Giacomo will cross at least 15 countries, including Italy where the boat will be launched. He will sleep in the boat under a canvas tent made from the type of truck tarpaulins that are no longer used. The canvas material is called Olona (a river in Italy), a very strong and waterproof cotton. The wood stove was made by a blacksmith friend from a beer mini-keg and will let Giacomo cook, keep warm and dry his clothes during the cold month of April in Northern Europe. He will also use it to bake bread, from flour given by country folk, farmers and millers he will meet along the way. 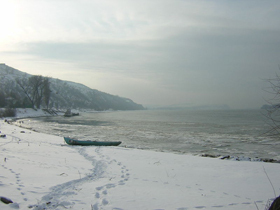 He will also sometimes build – with care – small fires, on the shores of the rivers and the Black Sea. For food he will rely on fish and fruit as well as any other food that people along the way may offer him. On board the boat will be some ropes, a knife, materials for repairing the sails and the wood, the stove, a sleeping bag, a cloth rubbish bin, two anchors, a mosquito net, a canvas hammock, some nautical maps (very few) and books, a tinder box, some spare clothes and a fisherman’s jacket. In every country he will take only a dry leaf and collect some drops of water, which will he will keep in 15 small glass bottles made by a Murano glass master. 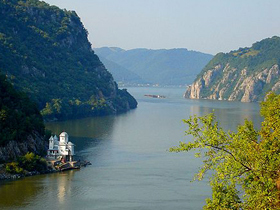 There will be about two hundred locks to pass through, the biggest in Serbia: that of the Iron Gates, which was once the most difficult point of navigation along the Danube. And then there will be tunnels, suspension bridges, where the boat will sail at a height of 30 metres above the ground, more than 400 bridges to sail under, 100 towns and cities, 4 capitals. 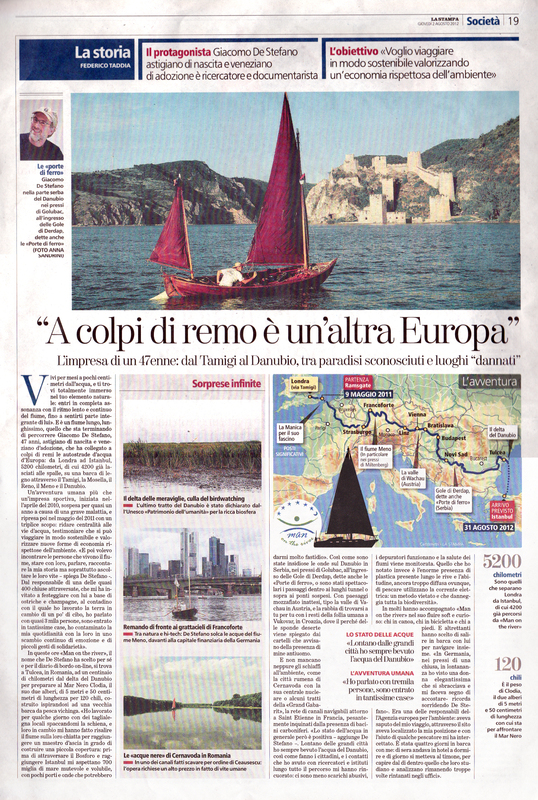 And he will pass by 200 million people who live along Europe’s two most important rivers. The boat will be transported from Venice to London by a courier who has kindly offered to leave a space for it on board the first truck that will have enough free space, beside the goods being taken to London anyway. This will optimize transport and will not cause any additional environmental impact. It will be a journey of both low and high technology. Giacomo will not use satellite navigation instruments but only the sun and the stars, and will carry out a predominantly simple navigation in coastal and protected waters. At the same time, thanks to some technology partners, Giacomo will be able to broadcast live from various locations he will stop at, to tell people what he has seen in the preceding kilometres. The electricity needed on board to charge the telephone necessary for talking on the radio will be supplied by a small solar panel. Then if anything is lacking en route, he will find it somewhere along the way. Know-how and care and attention will do the rest. Giacomo says: “When you have little, you make do with what you’ve got”. Giacomo will be all the more devoted to listening, observing and sharing information with those who know more than he does. He will take dreams with him, and dream new ones. Nightmares will be left at home. came to your fascinating project after reading about it at intheboatshed. Hope all will go well. Somewhere on your site`I´ve read that you will take the Danube from Donaueschingen. 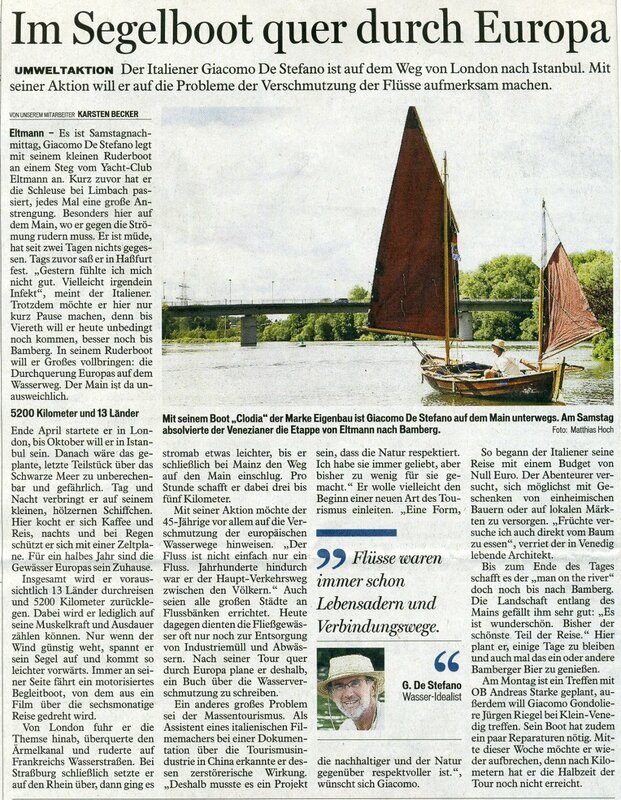 As far as I know the Danube is closed for all boating from Donaueschingen till the monastery of Beuron, if I´m correct. If you didn´t know already, I hope that helps in organizing. thank you so much for your information. How is it possible? Some work? How all the trafic will go? I will check imediately. I hope to see you on board. 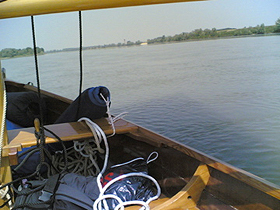 I will take the Danube near Regensburg. So, there, is open to navigation. I was really preoccupied. Ciao Carmen, purtroppo casuale però Man on the River ha molto a che vedere con la musica, come puoi vedere dai precedenti post su Mario Brunello e i Pianovelo! It was very nice to meet you as you rowed past me in my electric boat ‘Eddy Current’ on the Cookham Reach. Pity your solar panel will not run an electric outboard ! All the very best for your journey. attenzione che ti sto seguendo! Ho letto l’articolo su La Repubblica e, dunque, sono arrivato al tuo sito. Avrei l’intenzione di farvi una visita quando arrivate al Danubio, cioè a Kehlheim. Se c’è disponibilità verrei con voi per il brevissimo ma suggestivo tratto fino a Weltenburg, monastero con chiesa stupenda e birreria del 1050 e rotti, dove mi piacerebbe farvi brindare a padre Danubio che vi poterà con sé fino al mare… e a mio figlio visto che non sei più passato per conoscerlo. Spero di potermi organizzare. Voi, lo so, avete tempo! Inoltre, non so se vi possa interessare un poco di stampa locale bavarese per darvi maggiore visibiltà. Intanto incrocio le dita per l’attraversata fino alla terraferma. Caro Heribert, potresti cortesemente mandarci il tuo indirizzo e-mail alla nostra mail di info, che trovi qui, in modo tale che ti possiamo contattare? Grazie heribert, con grande piacere. Sei fantastico, scusa ritardo ma intensità del viaggio pazzesca. Tuo figlio?? ?Lo porti? Ma non ti voglio trattenere. Immagino che siamo in molti che ti scriviamo. Thank you Ian, thank you. It has been such a beautiful moment to meet you. There is a very short video of you in Wargrave to..
Ci siamo conosciuti a Venezia, quando ero studente con tua sorella Barbara. Heribert mi ha raccontato del tuo viaggio. Grazie Bruno, un abbraccio, bei tempi! 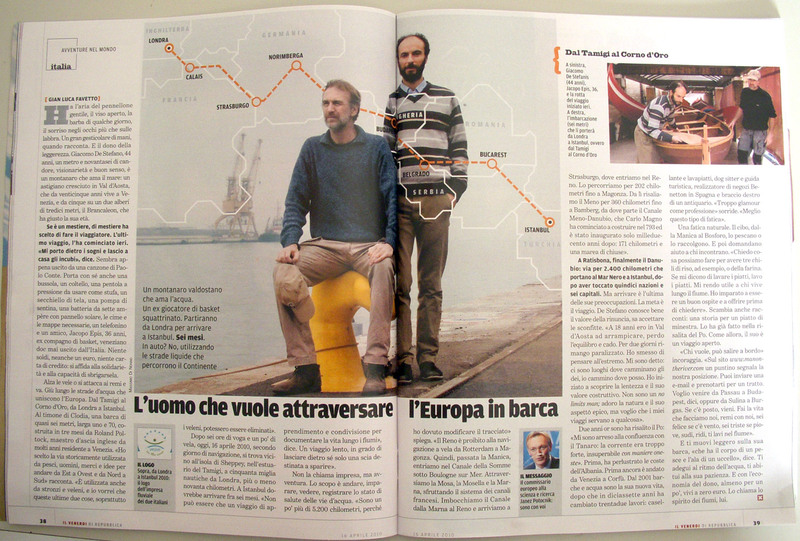 In barca spero di vederti..
A great idea for your holiday from life, but needing a support boat? Sort of defeats the project aims doesn’t it? Why cannot you just go alone, as many others have? It’s like our Prime Minister being photographed cycling to work, but we find out there is a car behind him carrying his files and clothes. To be accepted as serious you must be braver. North winds at present, and low swell are ideal to cross. Go alone. Ho avuto tramite Biba la notizia della BBC. Che avventura! Ti ho beccato proprio prima della traversata della Manica, e quindi gonfie vele! Non ci si vede da 5 anni ormai, ma è sempre bellissimo sapere di te attraverso questi viaggi fantastici. Grande. I will go alone! So simple!! Everybody love to scare someone. Yes old sea Salt i will go alone. It’s me now the problem. A little virus. Grazie Carlos, un abbraccio forte. Mi manchi malgrado i silenzia. Come stai ora? Prendi pure tutta la cortisone che ci vuole, e rimettiti in forma tranquilamente, con la sagezza che già ti caraterizza. gRANDE PASCALLLLLL, allora ci sei?? Grande che bello. Ci puoi giurare che arrivo, come Ulisse che ad Itaca ritorna. Duro il viaggio e i venti non sempre amici. Ma.. inchallah ‘rivo. Ciau Tayfun a presto! Tutto bene. Grazie per aspettare queste quattro ossa che scriccchiolano ormai più della barca. Un caro saluto. Sto seguendo il vostro viaggio. Sono un giornalista freelance e scrivo su alcuni giornali on line e vorrei se possibile qualche aneddoto o racconto di personaggi e situazioni del vostro viaggio, da far conoscere anche oltre oceano, visto che sono in contatto con alcune testate USA. Non appena pronto l’articolo, sarà mia cura comunicarvi il link da vedere. Buona vita a tutti. per queste richieste cortesemente scrivi a press@manontheriver.com. … i was your waitress on Sunday in Volkach….. and yes, i know now, that Macchiato is written with an H…..
Be save and God bless…..
how are you? You have been in our harbour in Kitzingen and I saw you just for a moment. But I left a present for you in your boat and I hope, you had a nixe breakfast with Mathias? Have a good journey and give a message back to me. It would be a pleasure. I´m the man with the twins sitting in your boat today. i´m fascinated from your idea, your website. Great, man. we see again on tuesday with proviant for your trip. We met on the 21st of September in Vienna. We are the Hungarians. We hope to see you in Dunakeszi , just before Budapest. Stay safe. thank you again for your present, I am wearing it right now in Venice. I am a bit late to the party . . just wanted to let you know that I have read all your posts now. Awesome overused but that is what your journey is. Il tuo progetto mi ha affascinato (ne ho letto su La Stampa). Ho visto il Danubio in diverse occasioni e nazioni, sempre da camperista, e ti invidio. In particolare avrai apprezzato il Delta, dove ho lasciato il cuore! In bocca al lupo per il Mar Nero. Dear Jean thank you for your comment. So awesome it is. You are right, too many awesome. Too many! My heart is going to explode. Diego, Grazie per il tuo commento. Sono rimasto sul Danubio. Non c’e mare che possa dare una ricchezza di paesaggi, sensazioni genti e culture come un fiume. E il Danubio, sotto questo punto di vista, è IL FIUME.